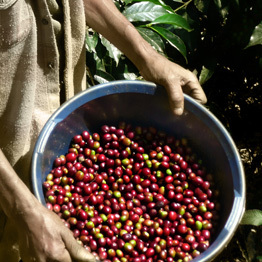 Organic Ethiopian coffees are rare in the specialty coffee industry. But through the efforts of family-owned Moredocofe Coffee Company, who is working to initiate a new era in Ethiopian farm management and sustainability, Batdorf and Bronson has been able to purchase this amazing coffee. The owners of Moredocofe are dedicated to working with the small farms in Ethiopia to produce distinctive coffees while facing the challenges of a delicate ecosystem, lack of farm management education and access to quality and sustainability initiates in their country. However, many new initiatives have now established cooperatives and organic certification processes in Ethiopia! The 2008 Ethiopia Sidamo is a washed coffee and that means that the coffee cherry (skin) is removed from the bean while the fruit is still moist and the beans are then placed in tanks of water to allow fermentation to occur so that the sticky pulp can be removed from the bean. The coffee beans are then washed yielding an exquisite coffee. Generally, the wet processed method enhances the acidity (brightness)of the coffee. I can image this being something of a feat in Ethiopia given the sometimes lack of water and the ability to address sustainability at the same time. The Sidamo is organic and is certified by the Rainforest Alliance for its environmental efforts along with certification for responsible sourcing and production. After we cupped the Sidamo, we were blown away by the coffee’s amazing orange blossom aroma and smoothness. Our first taste brought up some spiciness and maybe a little Bergamot. As the coffee cooled we noticed continued smoothness and sweet citrus flavors. Really delicious! Great job, Batdorf and Bronson on roasting this coffee and enhancing how exquisite a washed Ethiopian coffee can be. We are selling this coffee by the cup, French Press, Chemex or whole bean. Between the Panama Esmeralda and now the Ethiopia Sidamo I’ve been spending my days a little caffeinated!